The newest innovation in the patented Vegelatum® gel technology is Vegelatum® Omega-3, available in a gel or liquid format. Omega-3 rich flax seed oil is delivered from the Vegelatum® gel technology, and is proven to have significantly better stability when compared to flax seed oil alone. Omega-3 fatty acids are a cutting-edge consumer trend, with many well-documented skin and hair benefits. Having said this, natural plant oils that are rich in Omega-3 fatty acids, such as flaxseed oil, tend to be unstable and difficult to formulate with, which has limited their use in commercial products today. We have developed a new brand offering for the personal care industry to enable the delivery of stable, natural Omega-3 in a variety of products. Vegelatum® Omega-3 is the newest innovation in the patented Vegelatum® gel technology and is available in a gel or liquid format. These products have an Omega-3 content ranging from 7 – 12% and are proven to have significantly better stability when compared to flaxseed oil alone. Vegelatum® Omega-3 harnesses the natural petrolatum-like feel and thermostability benefits of the Vegelatum® series, with the added benefit of stable Omega-3 rich flaxseed oil. 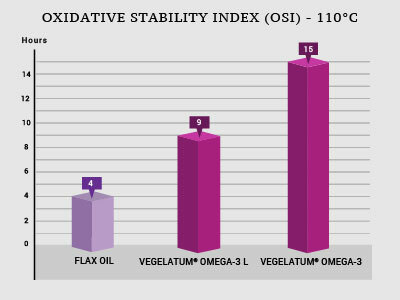 Oxidative testing conducted by an external laboratory has proven that Vegelatum® Omega-3 (gel) and Vegelatum® Omega-3 L (liquid) are significantly more stable when compared to flaxseed oil alone (OSI 110 degrees C).